This handsome Tudor-style duplex is among a handful of the much-admired Jorgensen-built properties located in Pacific Heights. The façade features a peaked roof line, tall bay windows, detailing and handsome archways. The property can serve a large residence for a household with an extended family or houseguests, or as a residence with income unit, depending on the new owner’s needs. The flats have been beautifully remodeled with all new kitchens, remodeled bathrooms and superlative finishes throughout. The inviting LIVING ROOM features tall bay windows, a newly installed gas fireplace with contemporary polished concrete facing, wide mantle and built-in bookcases. The formal DINING ROOM can comfortably seat a large dinner party. A small balcony overlooks the center patio. Parquet floors in the public areas have been beautifully refinished. The handsomely remodeled KITCHEN with breakfast room features honed granite countertops, ample tall cabinets and under counter storage with brushed chrome pulls. Recessed lighting and new hardwood floors have been installed. The long curved picture gallery to the bedrooms is a Jorgensen signature found in all his duplexes. Two sunny bedrooms, both with refinished hardwood floors, overlook the landscaped garden. The southeast corner BEDROOM has its own FULL BATH with marble surround, deep tub, separate shower, pedestal sink, and a cedar-lined walk-in closet. The southwest corner BEDROOM accesses the remodeled BATH off the hallway which has slatted tile surround, new deep tub and small vanity. A GUEST BATH, LAUNDRY ROOM with Bosch washer/dryer, built-in storage and sink, additional closets and elevator stop complete this level. Ascend the staircase (or use the dedicated elevator) to the wonderful MASTER SUITE which enjoys a wide expanse of glass and French doors opening to a spacious, private and sunny roof garden terrace. The suite features a coved ceiling, original leaded glass accent window, new hardwood flooring, custom built-in cabinets and a cedar-lined walk-in closet for ample storage. The luxurious MASTER BATH has slatted marble tile surround, limestone vanity and frosted glass divides for the wide shower. The private and convenient ‘ACME Home Elevator’ provides easy access to the upper flat from the garage to the gallery hall; a second elevator in the living room alcove accesses the upper level master suite. The LIVING ROOM features a large bay with tall windows, original wood burning fireplace with marble mantle and side-by-side bookcases. The formal DINING ROOM with brass chandelier and built-in cabinetry opens to the sunny CENTER TERRACE for alfresco dining. Refinished parquet flooring is found in the public areas. The remodeled KITCHEN with breakfast room enjoys quality fixtures & appliances, polished granite countertops, new hardwood flooring and fine finishes. A small room off the curved gallery overlooking the charming landscaped center patio can serve as an AT-HOME OFFICE; it is plumbed for a washer/dryer/sink if desired. The carpeted MASTER BEDROOM features a cedar lined walk-in closet and adjoining FULL BATH with marble surround, deep tub and separate shower. The second BEDROOM has use of the FULL BATH off the hall. Both bedrooms feature French doors that open to the level, walk-out private and sunny PATIO/GARDEN designed by noted landscape artist, Topher Delaney. 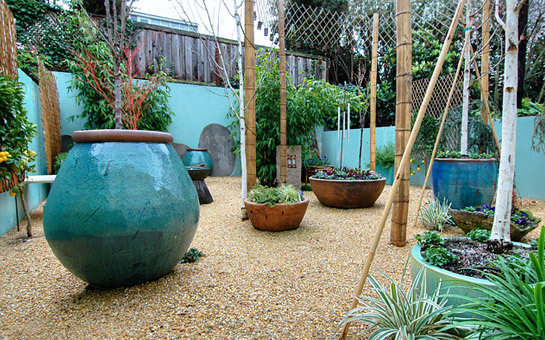 Exotic greenery, tall clay planters, seasonal blooms, a stone birdbath, trellis work and garden hangings are all artfully brought together to create a delightful yet tranquil ambience, a respite in the midst of City living. A List of Capital Improvements is available at the property. Capital improvements included a voluntary garage-level seismic upgrade (steel moment framing, concrete sheer wall addition and foundation bolting).